Ever wonder who the life of the safari is? It's go-go-gorillas! All safari guide Jungle Jed wants is for the gorillas to go to sleep, but after they brush their teeth and comb their fur, it's an all-out jungle boogie, complete with baby gorilla doing the robot. 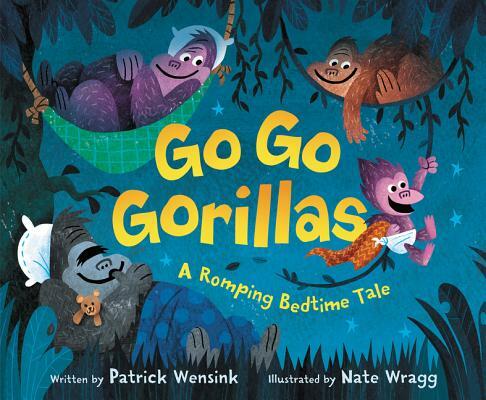 Brought to life with colorful and dynamic illustrations by Nate Wragg and bouncy text by Patrick Wensink, Go Go Gorillas is the perfect read-aloud. Fans of Giraffes Can’t Dance will giggle along at the silly antics of these not-so-sleepy gorillas in this lively, rhyming bedtime tale. Patrick Wensink is the author of Go Go Gorillas and Gorillas Go Bananas and is also the bestselling author of a bunch of boring books for grown-ups that have no pictures in them whatsoever! He lives in Portland, Oregon, with his wife and son. Much like a certain baby gorilla, Patrick was a picky eater as a boy. His favorite way to have a banana is in a pancake. You can visit him online at www.patrickwensink.com. Nate Wragg is the illustrator of Monster Trucks by Anika Denise, At the Old Haunted House by Helen Ketteman, and many other titles. He’s an art director, an illustrator, and now a three-star banana chef. Nate lives in Southern California with his beautiful wife and their wonderful daughter. You can visit him online at www.n8wragg.blogspot.com.